This year, Buffalo State's closest body of water was in focus for the "Year of Lake Erie," a multi-agency assessment that included researchers from the Great Lakes Center (GLC). Following a five-year rotation schedule—Lake Erie had previously been studied in 2004 and 2009—each of the Great Lakes is carefully observed through the Cooperative Science and Monitoring Initiative (CSMI), a binational effort started by the US Environmental Protection Agency (EPA) and Environment Canada in 2001. 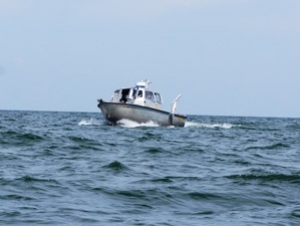 This year, researchers from the GLC, the U.S. Geological Survey (USGS), and the EPA Great Lakes National Program Office cooperated in the intensive study of Lake Erie. During the spring and summer, researchers collected more than 400 samples and 200 images of the bottom of the lake aboard the EPA’s R/V Lake Guardian and smaller GLC and USGS vessels. Samples were collected using either a Ponar grab or by diving in near-shore areas of bedrock. An underwater camera mounted on a towed, lake-crawling sled was employed to complete exploratory habitat mapping in the lake's central basin. Video footage will be analyzed to map invasive mussel abundance in relation to low-oxygen areas, confirmed with Ponar samples to assess mussel presence or absence. Analysis of collected data will estimate lake-wide and habitat-specific invertebrate abundance, determine the biomass of Lake Erie, and identify the long-term trends in dynamics of this extremely important community. Results will be presented in May 2015 in Burlington, Vermont, at the International Association for Great Lakes Research's annual conference. Read more from the GLC's fall 2014 newsletter.